Central Asia, since eighth century CE, has remained as one of the heartlands of Islam. Mawara al-Nahr (Transoxiania) is a name to reckon with in the annals of Islamic history and jurisprudence. The Abbasid rule (CE 750-1258) in this steppe region paved the way for setting the Islamic culture, and the reflection of positive results and Islamic ideology in all facets of life, nourishing the Islamic tradition and immensely contributing to the various socio-political institutions as well as diverse fields of knowledge. 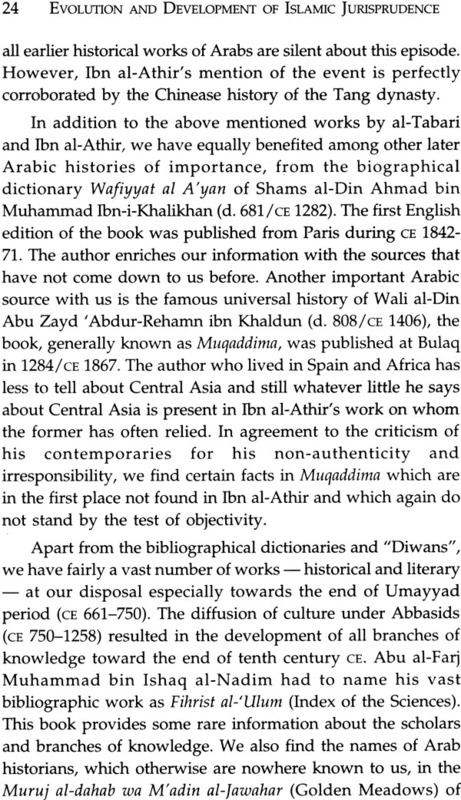 The early development of Islamic sciences and the involvement and contribution of Muslim intellectuals of Central Asia in their further growth remain as a splendid chapter of the Islamic history. This book represents Islam as a constructive force that nourished scholarship in varied Islamic sciences, especially in Islamic jurisprudence. It vividly analyses the Islamic legal theory and its development in varied phases, encompassing various regions, intellectual approaches and social practices, making it an appropriate legal system. 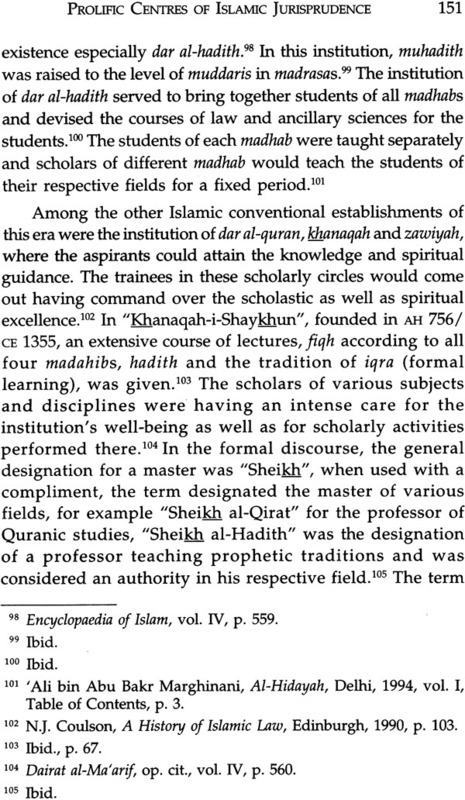 Central Asia, along with other Islamic intellectual centres like Baghdad, Basrah, Kufa and Madina, maintained the lure of standardized scholarship. This volume, while featuring the great jurists of Central Asia and their monumental works to the Islamic jurisprudence, initiates a debate on the relevance of Islamic legal theory and its interpretation in the contemporary socio- political scenario, thus providing certain possibilities of rediscovering Islamic jurisprudence for the present times. A book of high academic value, it should impress all in the field of Islamic history and legal system. Dr Showkat Hussain Dar was born in 1975 in Mohalla Kralteng Sopore (J &K). After completing his graduation from Govt. Degree College, Sopore, he pursued his MA Islamic Studies and distinguished himself with a gold medal in the faculty of Social Sciences, the University of Kashmir. Dr Hussain pursued his M. Phil. and Ph.D. from Centre of Central Asian Studies, the University of Kashmir and was awarded the doctorate in 2009. He has to his credit a good number of articles published in the academic journals of international repute. His fields of specialization are Islamic Jurisprudence, Islamic Finance and Investment, and Central Asia. Dr Showkat Hussain has conducted, organized and participated in national and international seminars, presenting research papers on varied themes. The author has a good command on Arabic and Persian as well. Presently, he is working in Department of Islamic Studies, Islamic University of Science & Technology, Awantipora J&K) as Senior Assistant Professor and is heading the department since 2010. THE vast territory of Central Asia has remained among the heartlands of Islam since second/ eighth century CE. The region, in the chronicles of the Islamic history, has been identified and referred by the name Mawara al-Nahr (Transoxiania), the territory beyond the river Jayhun (Oxus). It was during the reign of the Umayyad caliph Hisham (AH 724-43) that his eminent governor, Qutaybah bin Muslim conquered this vast territory and annexed it with the Islamic caliphate from CE 712-15. The Umayyad reign (CE 661-750), after introducing Islam, could not go beyond the construction of the mosques and rehabilitating the Muslims in this region. However, these efforts paved the way for setting the Islamic culture as well as the Muslim identity in this region. Henceforth, Muslim institutions, be it social or political got momentum to maintain identity in the steppe. With the establishment of the Abbasid rule (CE 750-1258), positive results and impact of the Islamic ideology could be seen in almost all aspects of the community life. The socio-intellectual activities of the Muslims proved to be much constructive to cultivate the high academic and institutional set-up in this region. Since then, it has evolved as an illustrious region that nourished the Islamic tradition and made renowned contribution to the various socio-political institutions as well as diverse fields of knowledge. Central Asia, being located at a pivotal position both geographically as well as culturally, influenced the entire landmass and set a consummate landmark in developing Islamic sciences in a systematic manner. The early development of the Islamic sciences and involvement of the Muslim intellectuals of Central Asia will always remain as a splendid chapter of the Islamic history. 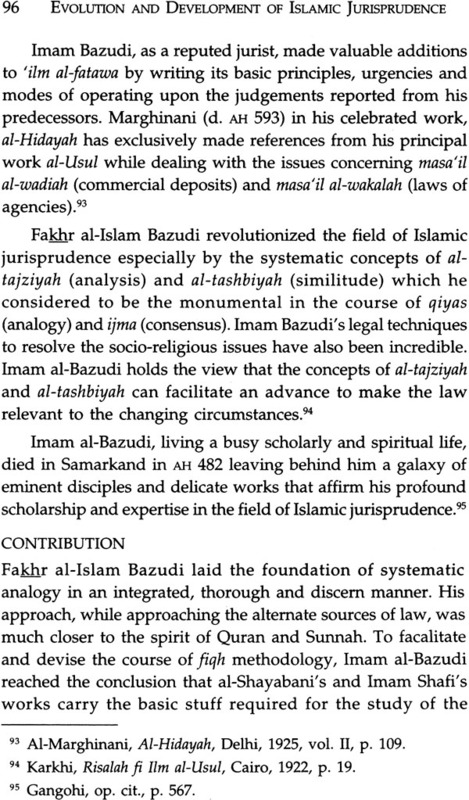 The present work, Evolution and Development of Islamic Jurisprudence in Central Asia, represents Islam1 as a constructive force that nourished a versatile scholarship into a variety 01 Islamic sciences ('ulum) especially in the field of Islamic jurisprudence. The Islamic legal theory and its development in various phases encompass various regions, intellectual approaches and social practices that broadened its horizon to mature as an appropriate legal system. 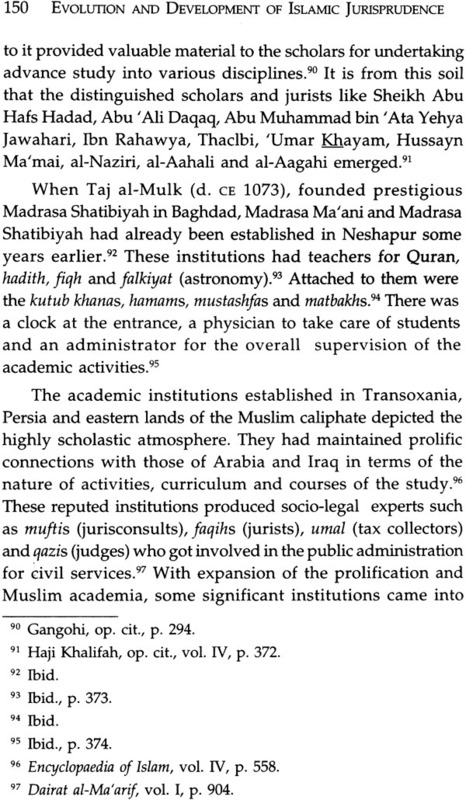 Along the Muslim intellectual centres like Baghdad, Basrah, Kufa and Medina, the cities of Central Asia maintained the lure of standardized scholarship as analysed in the proceeding chapters of the present work. 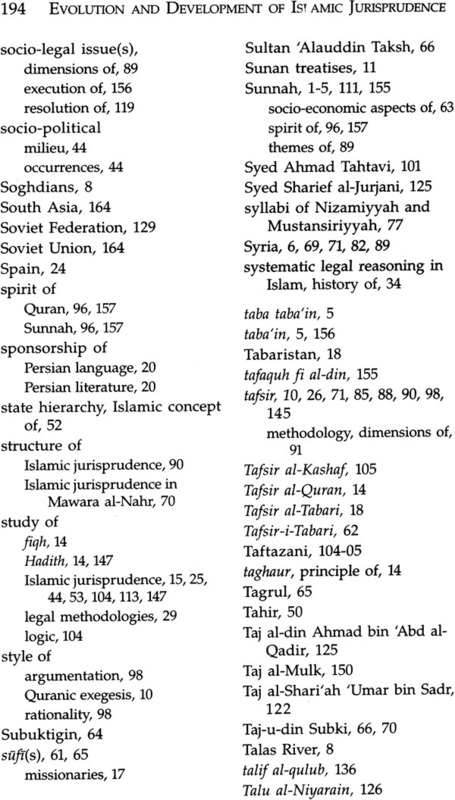 The first chapter, "Introduction" is the conceptual background of the evolution and development of the Islamic legal theory in Central Asia. The chapter, simultaneously, narrates the process of the expansion of Islam beyond Arabia and approaches of the Muslim jurists regarding interpretation and application of the legal theory. This chapter also examines the development of various branches of learning and concern of the ruling dynasties for the cultivation of the academic endeavour. 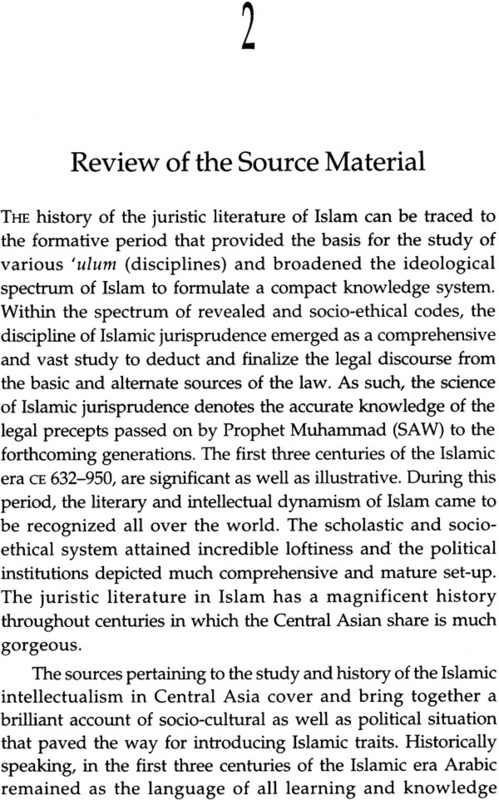 The second chapter, "Review of the Source Material" discusses and elaborates the source material pertaining to the study of Islamic jurisprudence as well as its introduction in Central Asia. This particular constituent endorses the relevant material of Islamic jurisprudence compiled in different languages throughout the Islamic lands. The third chapter, "Socio-Political Milieu" elaborates and discusses socio-political milieu of Central Asia from CE 750- 1258 in addition to the concentration upon the intellectual activities especially during the period under consideration. This chapter also acknowledges the efforts of various ruling dynasties and scholars that took pride in patronizing the knowledge tradition and transmitting it to the forthcoming generations. 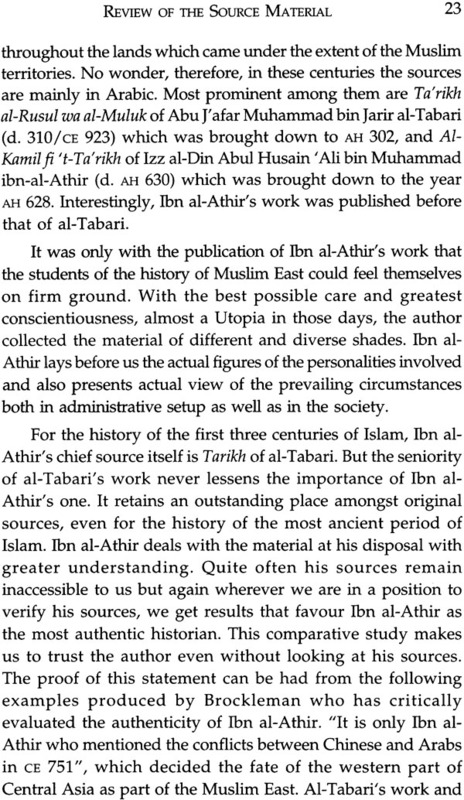 The chapter, as such, envisions the establishment of an absolute academic endeavour that proved to be a distinction to the Islamic legacy. 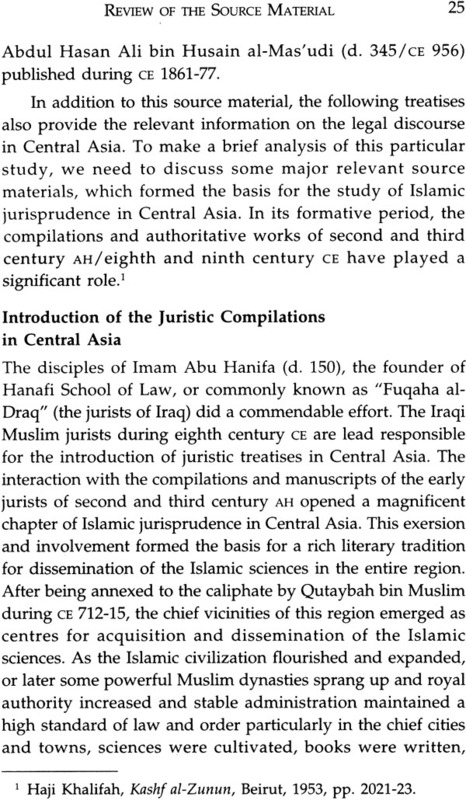 The forth chapter, "Central Asian Jurists: Contribution and Impact" is a detailed account of the reputed jurists who contributed an immense share to the development of Islamic jurisprudence. This chapter is exclusively dedicated to analyse the legal dynamism of the Muslim jurists who formed the basis for the study and interpretation of legal discourse by virtue of compiling monumental works in this field. Their concentration upon the primary sources of the law (Quran and Sunnah) and interpretation of a commandment (hukm al-shara'i) to go well with the circumstances will also be studied. 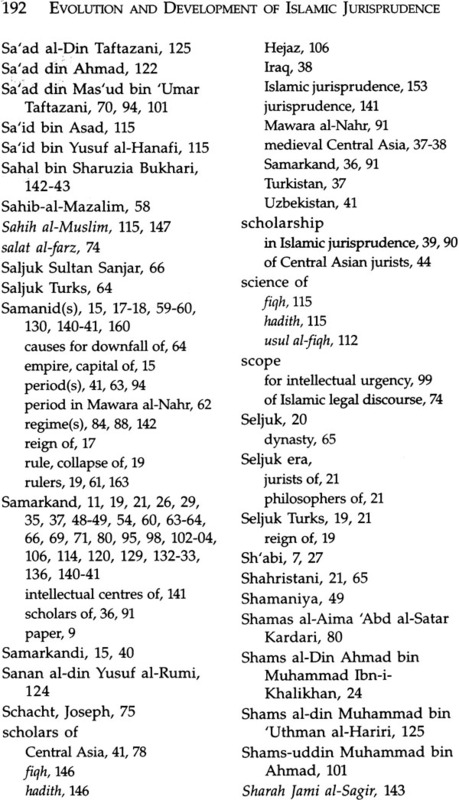 The fifth chapter, "Prolific Centres of Islamic Jurisprudence" recognizes the major centres of Muslin intellectualism in Central Asia that played a significant role for the promotion and dissemination of the Islamic sciences. The last chapter "Conclusion", sums up the whole narrative and initiates a debate -regarding -relevance of the Islamic legal theory and its interpretation in the contemporary socio-political scenario. The debate is relevant as it explores certain possibilities of rediscovering Islamic jurisprudence for the present times. 'ILM AL-FIQH (the science of Islamic jurisprudence) is one of the core disciplines of Islamic studies. 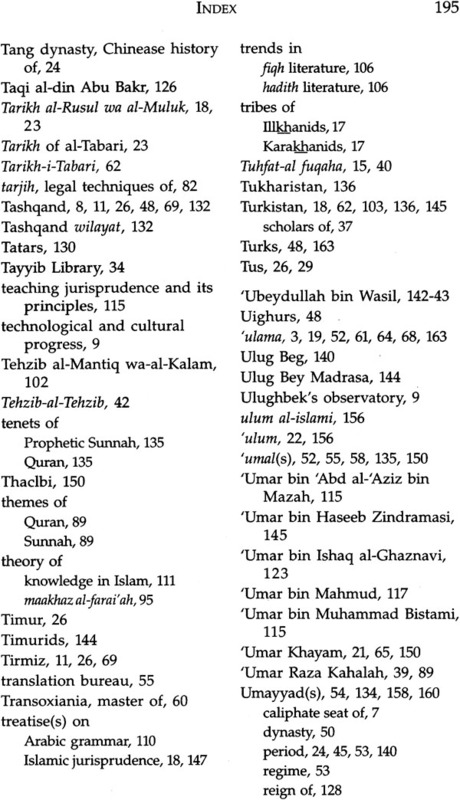 As a special branch of the Islamic knowledge system, it has developed through various phases, and the history of its development simultaneously runs along with the history of Islamic civilization.' The Arabic word fiqh is a derivation from tafaquh which literally means the absolute understanding. The term has also been used to denote the appropriate understanding to know the essence of the commandments (ahkam) prescribed in Quran and Sunnah. Technically, the term fiqh refers to the knowledge of deducing laws and verdicts from the basic sources of Shari'ah namely Quran and Sunnah.' Thus the science of Islamic jurisprudence treats Quran and Sunnah as the origin and the primary source of Shari' ah. 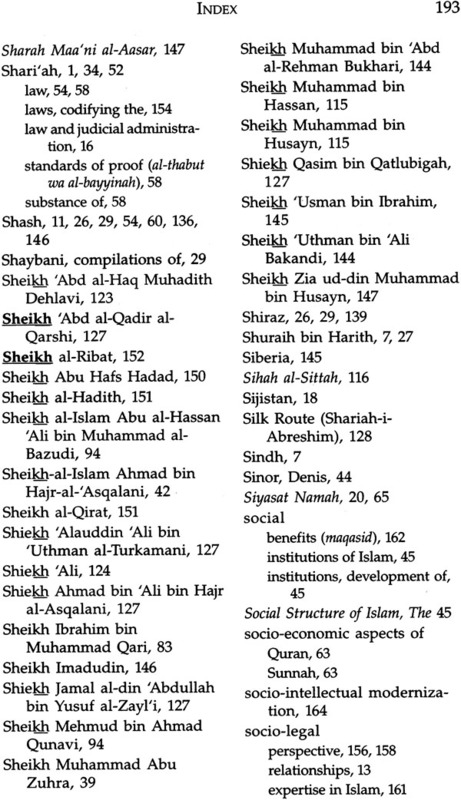 The primary sources mentioned here constitute the foundation as well as the core of Shari'ah. The Quran was revealed in peacemeal fashion in fragments and sections required as per the circumstances to facilitate the understanding of the text, value its relevance and implant gradually its norms for the final implementation. The revealed book has been preserved, word for word, in its complete and original form to serve as a source of guidance for all the times and situations. Quran provides a general theoretical framework containing universal and practical rules, principles, exhortations and commandments which are manifest, sublime and blessed. The Quranic verses have been classified into three categories as per the plan of instruction; the articles of faith, the ethical and legal instructions, and the regulations concerning state and society. The bulk of the Quranic content is ethical and moral. The legal prescriptions deal as per the situation enabling society to identify itself as per the Quranic reflection. The Sunnah consists of all the authentic reports of the acts, utterances and tacit approval of the Prophet Muhammad (SAW). Initially, there existed a distinction between the terms Sunnah referring to the practices of the prophet and Hadith denoting his utterances as narrated by his companions. Gradually, with the passage of time, however, the entire Sunnah was reflected in Hadith to such an extent that by the fifth century AH, the two terms became completely synonymous. Quran is definitive as well as final and authoritative as a whole and in its detail. Sunnah is neither definitive nor final or authoritative in its detail but must be taken as a whole. There are three possible relations of Sunnah to Quran. The first is where Sunnah agrees with Quran in all respects, and in such a case the two corroborate and reinforce the given point. The second is where Sunnah explains and illustrates Quran and the third is where Sunnah legislates on a matter on which Quran is silent. No other possibilities exist for Sunnah can never run counter to Quran. The secondary sources of Shari'ah include all those methods and procedures employed by the Muslim jurists to comprehend and operationalize the divine will as contained in Quran and Sunnah. Hence the word fiqh (Islamic jurisprudence), during the earlier phase of Islamic era (first century AH), had a comprehensive and vast meaning; to denote besides Quran and its interpretation, the accurate knowledge of the legal decisions passed on by the Prophet (SAW) and his companions to the forthcoming generations.' 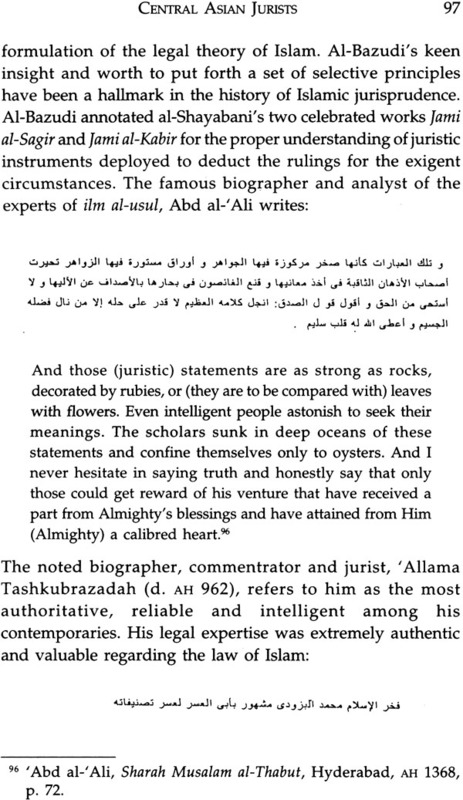 To interpret Quran or Sunnah with a view to deduce legal verdicts (ahkam al-shara'i) from the indications (ishrah al-nass), the science of jurisprudence emerged as a substantial discipline trying to reveal the best that could suit the circumstances without any contradiction to the basic sources. So it is necessary that the language of Quran and Sunnah be clearly approached and understood. To be able to utilize these sources, mujtahid (legal expert) must obtain a firm grasp of the words of the text and their precise as well as broad implications. For this purpose, 'ulama of 'usul includes the classification of words and their usages in the methodology of usul al-fiqh. The rules that govern the origin of words, their usages and classification are primarily determined on linguistic grounds and, as such, they are not an integral part of the law or religion. However, they are instrumental as an aid to the correct understanding of Shari'ah. Normally mujtahid will not resort to interpretation when the text itself is self-evident and clear. However, by far the greater part of fiqh consists of rules, which are derived through interpretation and ijtihad (exertion). As will be discussed later, ijtihad can take a variety of forms, and interpretation, aiming at the correct understanding of words and sentences of a legal text, is of crucial significance to all forms of ijtihad. The function of interpretation is to discover the intention of the lawgiver - or of any person for that matter - from his speech and actions. Interpretation is primarily concerned with the discovery of that which is not self-evident. Thus the objective of interpretation in Islamic Law, as in any other law, is to ascertain the intention of the lawgiver with regard to what has been left unexpressed as a matter of necessary inference from the surrounding circumstances. Thus, the legal verdicts of Quran and Sunnah are to be properly interpreted to make any possibility of further legal discourse. Simultaneously, along the compilation of Hadith and Sirah literature, the legal precepts were preserved and passed on through the authority of most learned and reliable men to be consulted while resolving and providing the legal references on specific occasions. 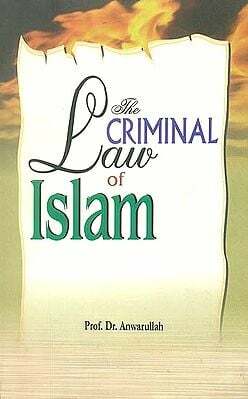 The science of Islamic jurisprudence, in its developed from came to recognize a variety of sources, methods and approaches from and through which laws and rulings may be derived." With the result of this process, different schools of law (madahib) within Islam formulated their legal interpretations to unveil the nature and derivatives of the revealed commandments. 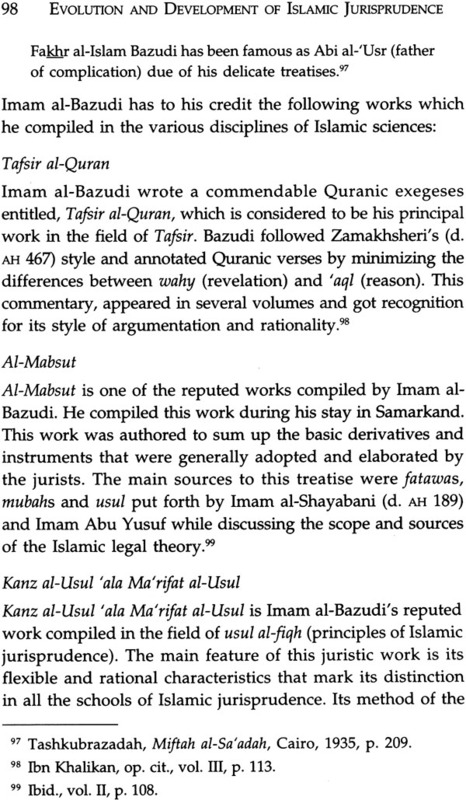 The primary sources of the Islamic law, Quran and Hadith provide the basis and subject matter of the legal theory. While as the secondary sources, through which the law may be derived, represent the methods of qiyas (reasoning) or the sanctioning instrument of ijma (consensus) and are still identified as the valid sources of the Islamic law. In addition to this, ijtihad (exertion), urf (custom), istehsan (juristic preference), istidlal (referring) and masaliah al-mursalah (the law of suitability) are among the approved legal tools that have been identified and applied as the alternate methods for the deduction of law." 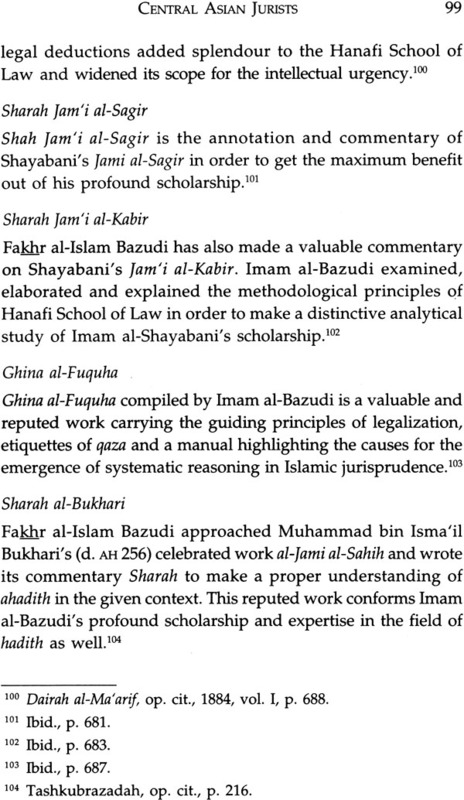 The classical juristic schools of the Islamic jurisprudence interpreted and discussed all these alternate vehicles to support their arguments while conforming the appropriate judgement. As a result, both, hukm (precept) and zaman (time) acted together and formulated the deducting principles for understanding and resolving the confronting issues. 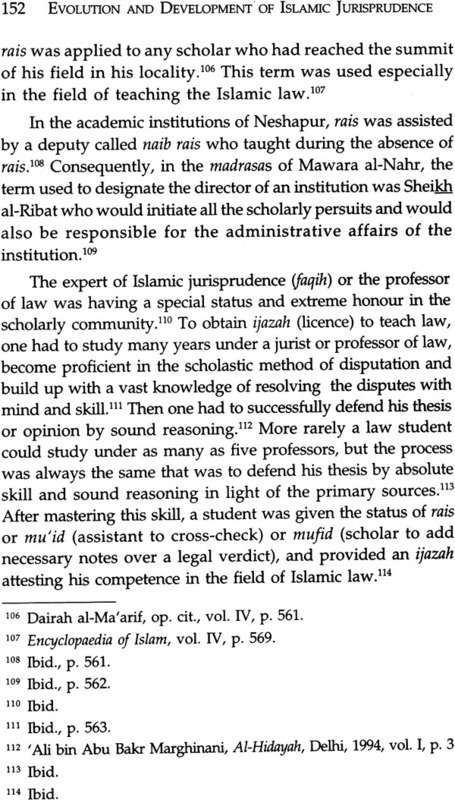 This process resulted in the development of the Islamic legal theory and provided imkan (chance) for rediscovery of further advance debate in this discipline.